This recipe is from my childhood its so easy to prepare and very tasty! Its always popular at picnics and parties. Usually in Ukraine we add to the zucchini fresh garlic so that will make the dish sharper and a little spicy. You can use any fresh herbs depending on your preference like cilantro, dill, parsley, chives, thyme, etc. 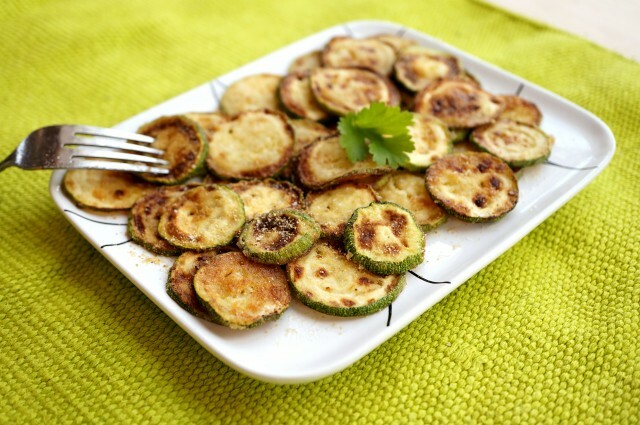 Don’t pour too much oil when you are frying the zucchini chips or they will be soggy and cook them over medium heat. Try to cook this dish with you kids, they can help you to roll the zucchini in the flour or fry them in a pan like my kids. 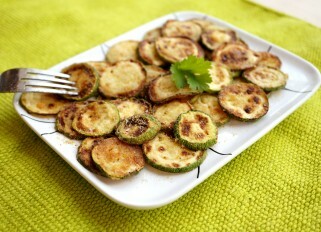 Cut the zucchini into thin slices, and sprinkle flour over each slice so its covered lightly. Bring to a hot pan and fry on both sides until golden brown. 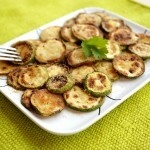 Lay the finished zucchini on a plate, sprinkle with salt and garlic powder and top with herbs.